October 19, 1940 The Brooklyn Museum’s plans for the greater part of the 1940-41 season and the first part of the 1941-42 season have just been announced. 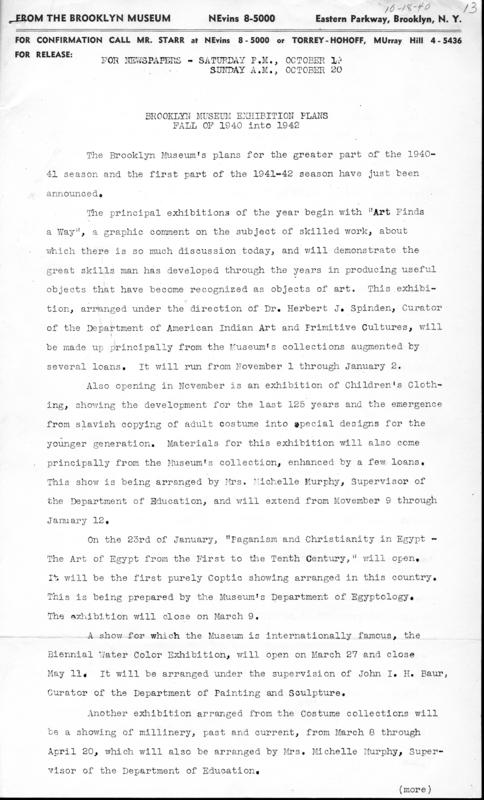 The principal exhibitions of the year begin with “Art Finds a Way,” a graphic comment on the subject of skilled work, about which there is so much discussion today, and will demonstrate the great skills man has developed through the years in producing useful objects that have become recognized as objects of art. This exhibition, arranged under the direction of Dr. Herbert J. Spinden, Curator of the Department of American Indian Art and Primitive Cultures, will be made up principally from the Museum’s collections augmented by several loans. It will run from November 1 through January 2. Also opening in November is an exhibition of Children’s Clothing, showing the development for the last 125 years and the emergence from slavish copying of adult costume into special designs for the younger generation. Materials for this exhibition will also come principally from the Museum’s collection, enhanced by a few loans. This show is being arranged by Mrs. Michelle Murphy, Supervisor of the Department of Education, and will extend from November 9 through January 12. On the 23rd of January, “Paganism and Christianity in Egypt - The Art of Egypt from the First to the Tenth Century,” will open. It will be the first purely Coptic showing arranged in this country. This is being prepared by the Museum’s Department of Egyptology. The exhibition will close on March 9. A show for which the Museum is internationally famous, the Biennial Water Color Exhibition, will open on March 27 and close May 11. It will be arranged under the supervision of John I. H. Baur, Curator of the Department of Painting and Sculpture. Another exhibition arranged from the Costume collections will be a showing of millinery, past and current, from March 8 through April 20, which will also be arranged by Mrs. Michelle Murphy, Supervisor of the Department of Education. The last large exhibition of the season will be made up of art from the printing press, to demonstrate the problems of those who are producing art every day, week and month for the great public, and the process involved in doing so. This exhibition is being arranged by a committee composed of Ralph Halker, architect, George Welp, art director, and Edward A. Wilson, illustrator, together with representatives of the Museum. Following the Silk Screen Prints exhibition, arranged by the Print Department, which opened September 20 and will run through October 20, is “The Stage is Set”, running from October 4 through November 17, made up of reproductions of theatre, opera and ballet subjects selected from Library material. As the result of the continual work which is going on in the Photographic Department at the Museum of the printing of negatives from the George B. Brainard Collection of 2,500 views of this part of the country, a third showing of prints will be put on view October 11 and will continue through November 3. On the 24th of October the Print Department will hang an exhibition of Current Campaign Cartoons by artists well known in this field, which will continue through December 1. During the same period but opening a day later, October 25, a gift in the form of a group of pressed glass, collected by Mrs. William Greig Walker and presented to the Museum as the result of a subscription fund, will be shown for the first time. The 138 items are all impressed with subjects relating to persons and events that held public interest in the United States, and to some extent in Europe, between 1820 and 1940. The title of the exhibition is “History in Pressed Glass. “The Nativity in Art,” made up of reproductions of 15th Century woodcuts and medieval manuscripts, will be put on view November 22 to continue through January 5. This exhibition was arranged by Miss Alice Ford, a member of the Art Reference Library staff. A showing of Recent Accessions will open on December 5 and extend through January 12. In this same period the exhibition called “Forever Young” will be shown. The latter will be composed of illustrations for children’s books, arranged by the Print Department. January 18 through February 2 the annual showing of the work of Brooklyn artists, restricted this year to water colors, will be arranged by John I. H. Baur, Curator of the Department of Painting and Sculpture, and there will be another exhibition in January of other views of Brooklyn and Long Island from the George B. Brainard Collection, from January 9 through February 9. For the 1941-42 season the following exhibitions are already planned: Paintings by John Quidor (1801-1881), and also a collection of works by William S. Mount (1807-1868), both arranged by John I. H. Baur, Curator of the Department of Painting and Sculpture; and “Colonial Art of Latin America,” prepared under the supervision of Dr. Herbert J. Spinden, Curator of the Department of American Indian Art and Primitive Cultures. Brooklyn Museum Archives. Records of the Department of Public Information. Press releases, 1939 - 1941. 10-12/1940, 181-3.
the work of William Sidney Mount and John Quidor. They are shown together as they both worked in the same period but with very different approaches to painting, although each began as a limner; namely, sign painters and fire engine decorators. The exhibition will be the first comprehensive showing of the work of either man ever to be held. Sixteen of the eighteen known Quidors will be on view, and there will be some one hundred and ten oil paintings, oil sketches and drawings by Mount. Mount had some breadth of reputation in his own day but Quidor was completely obscure. Mount is considered the first American genre painter. His popularity stemmed somewhat from the manner in which he painted and in his approach, which was the preference of the time; that is, realism and the use of familiar subjects. Quidor, on the other hand, was a romantic who took for his subject-matter fanciful ideas from American literary sources, especially the writings of Washington Irving and James Fenimore Cooper. 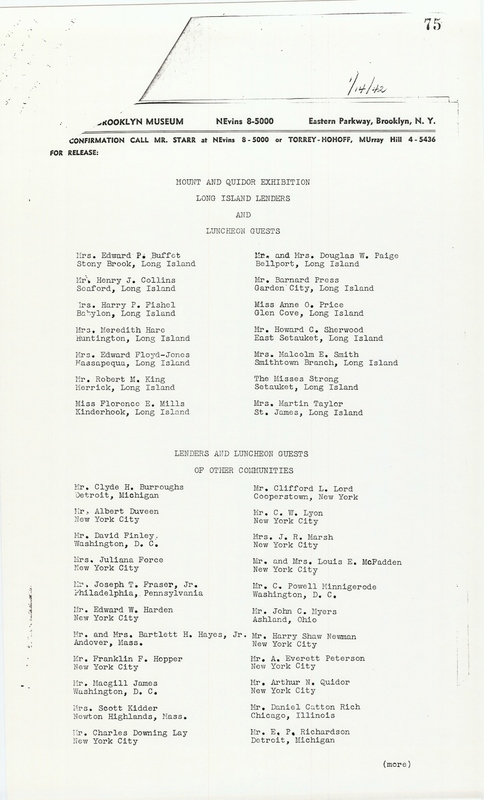 Mount is associated with Long Island, the Stonybrook area; Quidor with New York City were he had a host of addresses. In the William Dunlap book on American arts and design, the first American art reference book, published in 1834, the author says of Quidor: “Mr. Quidor was a pupil of John Wesley Jarvis. He had painted several fancy subjects with cleverness. His picture of Rip Van Winkle has merit of no ordinary kind. 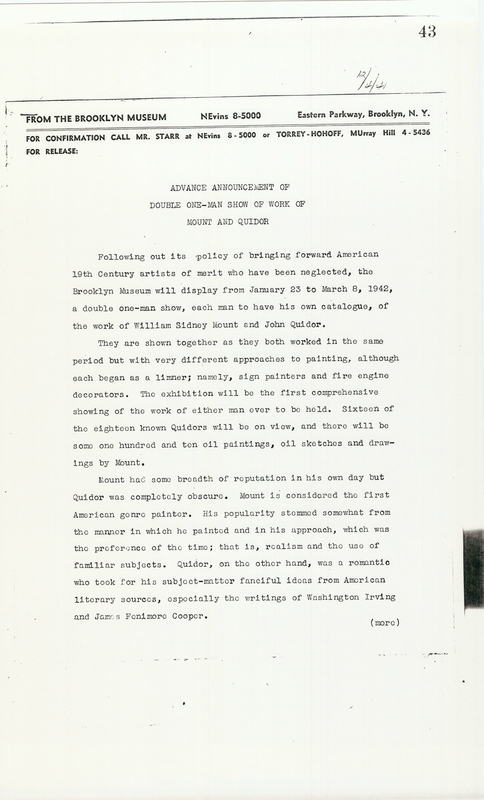 His principal employment in New York, has been painting devices for fire engines, and work of that description.” This is the total of the words devoted to Quidor. The dates of the two men are: Mount, 1807-1868; Quidor, 1801-1881. NOTE TO EDITOR: Photographs of the paintings to be shown are available now at the Museum. Catalogues with full discussions of each man will be available a week before the opening of the exhibition. Brooklyn Museum Archives. Records of the Department of Public Information. Press releases, 1939 - 1941. 10-12/1941, 259-60. June 8, 1942 The man who is turning out to be most eminent strictly Long Island artist in the history of American art, William Sidney Mount, and a hitherto almost unknown painter, who painted in New York City and up the Hudson River Valley to Peeksill, John Quidor, will both be given one-man shows at the same time at the Brooklyn Museum, from January 23 through March 8. They worked in almost exactly the same period, but each from entirely different approaches to painting. Both are interesting in that they leaned heavily on what is now familiarly called commercial art, both make a start and in some cases to keep alive. Instead of advertising and magazine illustration, the practical source of income for many artists today, these men both painted signs and decorated fire engines. Mount at the age seventeen went to work for his brother Henry as an apprentice in the sign painting firm of Inslee & Mount, in New York. Quidor was also listed as a sign painter, but he applied his trade extensively on fire engines. There is an anecdote about a panel done for the New York Columbian Fire Engine No. 14, built in 1847. The fire engine was immured in the corporation yard for a year because of a flagrant offense committed by the Company. During that time Quidor’s panel disappeared. However, on the return of one of the members of the Company, who was a mate on board one of the Havre Line packets, he produced it and restored the panel to the Company. He had taken it to France on his voyages. Thus a Quidor got to France, probably the only one to do so. Both the panel and the engine finally disappeared. A FINAL RELEASE WILL FOLLOW. Brooklyn Museum Archives. Records of the Department of Public Information. Press releases, 1942 - 1946. 01-03/1942, 009-10. 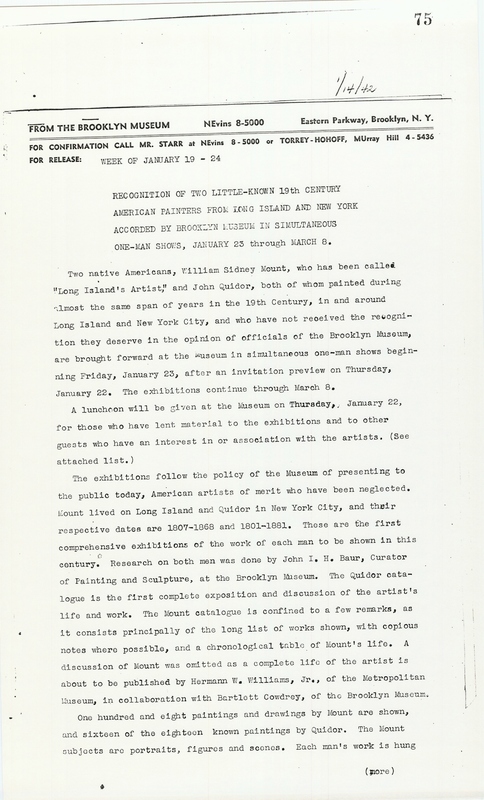 January 17, 1942 On Friday, January 23, the Brooklyn Museum will open to the public a double one-man exhibition of the work of William Sidney Mount, called “Long Island’s Artist,” and John Quidor, who lived in New York City; both native 19th Century American artists, who worked in almost the same years. Officials of the Brooklyn Museum are taking this step to overcome the neglect which these artists have suffered. There will be a luncheon on Thursday, January 22, at the Museum before the preview, for lenders of pictures to both exhibitions, many of them Long Islanders, and other guests. The exhibition will continue through March 8. Each man’s work will be shown in separate galleries and there will be special catalogues for each, Mount, a realist, called the first American genre painter, who was acclaimed in his time and a did a good deal of work, will be represented by 110 examples. Quidor, who was not popular during his lifetime, possibly because of his interest in imaginative, lively subjects, will be represented by 16 of the 18 paintings by him known to be in existence. Both men began as “commercial artists,” that is, sign painters. Quidor depended for his living on the painting of signs, banners and the colorful panels with which fire engines were decorated. Brooklyn Museum Archives. Records of the Department of Public Information. Press releases, 1942 - 1946. 01-03/1942, 013. 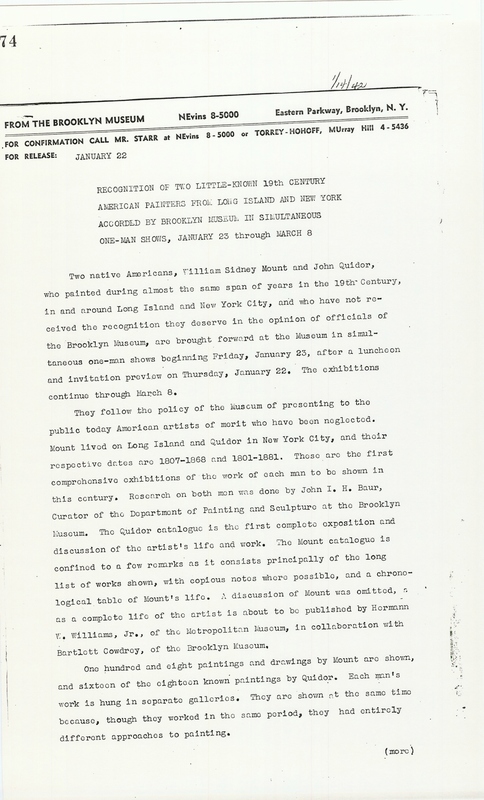 January 22, 1942 Two native Americans, William Sidney Mount and John Quidor, who painted during almost the same span of years in the 19th Century, in and around Long Island and New York City, and who have not received the recognition they deserve in the opinion of officials of the Brooklyn Museum, are brought forward at the Museum in simultaneous one-man shows beginning Friday, January 23, after a luncheon and invitation preview on Thursday, January 22. The exhibitions continue through March 8. They follow the policy of the Museum of presenting to the public today American artists of merit who have been neglected. Mount lived on Long Island and Quidor in New York City, and their respective dates are 1807-1868 and 1801-1881. These are the first comprehensive exhibitions of the work of each man to be shown in this century. Research on both men was done by John I. H. Baur, Curator of the Department of Painting and Sculpture at the Brooklyn Museum. The Quidor catalogue is the first complete exposition and discussion of the artist’s life and work. The Mount catalogue is confined to a few remarks as it consists principally of the long list of works shown, with copious notes where possible, and a chronological table of Mount’s life. A discussion of Mount was omitted, as a complete life of the artist is about to be published by Hermann W. Williams, Jr., of the Metropolitan Museum, in collaboration with Bartlett Cowdrey, of the Brooklyn Museum. One hundred and eight paintings and drawings by Mount are shown, and sixteen of the eighteen known paintings by Quidor. Each man’s work is hung in separate galleries. They are shown at the same time because, though they worked in the same period, they had entirely different approaches to painting. Mount had some breadth of reputation in his own day, but Quidor was obscure as far as the public was concerned. Mount is considered the first American genre painter, a painter of familiar and homely subjects. His popularity stemmed somewhat from the manner in which he painted and his approach, which was the preference of the time; that is, realism and the use of familiar subjects. Quidor, on the other hand, was a romantic who took for his subject-matter imaginative, fanciful ideas from the works of American writers who were his contemporaries, especially Washington Irving and James Fenimore Cooper, which he painted in a lusty, humorous, robust manner. An idea can be gained of each man’s work from some of the titles of the pictures. Among Mount’s titles are, “The Truant Gamblers,” “Bargaining for a Horse,” “Farmers Nooning,” “Raffling for a Goose,” “Fortune Telling,” “Children with Bird’s Nest,” “Eel Spearing at Setauket,” “View of Crane Neck, Setauket,” “Who’ll Turn the Grindstone?” “View of the Sound Over Long Island Shore,” “Barn on the Salt Meadows” and “A Suffolf Scene.” About a dozen works were reproduced by lithography and engraving. Three were engraved in this country, and six hand-colored lithographs were produced by Goupil and Vibert in Paris. Although Mount was recognized in his own day, his name has been forgotten except by the comparative few, some in the art field and others on Long Island, particularly around Stony Brook, Mount’s home neighborhood, and other communities, where he is remembered by those who own his works, which they have lent generously to the exhibition. He was eminent enough in 1834 to have a page and a half devoted to him in William Dunlap’s volume on American art and design, published in that year, the first American art reference book. There are no indications of economic struggle on Mount's part. Some of this, as least, was due to his success at obtaining work and selling pictures. He had another interest besides painting, which was music. One result of this was the development of a new type of violin called “The Cradle of Harmony” or “Hollow Back Fiddle.” Another expression of his ingenuity was a portable studio which he planned and had built. It is now part of a house on Long Island. Mount was put in contact with painting he served, at the age of seventeen, as an apprentice in his brother Henry’s business of sign painting that operated under the name Inslee & Mount, in New York City. While learning this trade it was discovered he had sufficient talent to justify his striking out on a career as a professional painter. John Quidor was known best in his time as a painter of banners or sings and the highly decorative backs of the elaborate fire engines which were then the rule. None of Quidor’s practical art is known to be still extant. Mount was born in Setauket, Long Island. His father was both a farmer and inn keeper. When Mount was nine years old his mother moved the family from the tavern to the farm of her father, Jonas Hawkins, at Stony Brook, now spoken of as the Mount Homestead, and owned by Mrs. Edward P. Buffet, whose husband wrote the first extensive life of Mount. At seventeen the young man started his apprenticeship in his brother’s newly founded sign-painting business. But two years later he entered the art school of the National Academy of Design and exhibited for the first time at the Academy in 1828. In 1829 he decided to become a portrait painter and took up residence in New York City, where he lived until 1836. In 1831 he was elected to full membership in the Academy at the age of twenty-five. From 1836 until his death in 1868 his residence was Stony Brook, but he travelled about considerably, visiting New York and going up the Hudson valley. John Quidor was born in Tappan, New York, January 26, 1801. The name is possibly of French origin and has variants such as Quidore, Quidoir, and Quidort. His father, according to the old New York City Directories, was a teacher. In 1811 the family moved to New York City, where Quidor spent most of his life. By the early 1820’s he took up the study of painting, as an apprentice of the well-known portrait painter, John Wesley Jarvis. A colleague in his studies was Henry Inman, a painter who became well known as one of the foremost American portrait painters of his day. In the 1827 Directory, Quidor is listed as a portrait painter living at 166 Spring Street. According to the Museum’s catalogue the painter began a career at the time of a typical New Yorker, judging by the fourteen different addresses he is known to have had during his life in the city. Three of his pictures were exhibited in 1828 at the newly founded National Academy of Design. This was the first introduction of his work to the public. It brought forth a few enthusiastic champions but the cool reception it was accorded by the majority was a forecast of what he was due to suffer until the present time. He had the misfortune, economically, of being interested in painting subjects that were not in the vein of popular taste, which preferred work such as Mount’s and fashionable portraits. There remains a first-hand account of Quidor at about 1830, written by a Colonel Thorpe who spoke of him as the only avowed figure painter in New York at the time. Quidor had his sign-painting shop and studio at 516 Pearl Street, near Center. The rooms were without ornament of any kind and coated with dust. The furniture consisted of two or three dilapidated chairs, a home-made easel and a long bench on which the artist slept when he did not go home. Between 1843 and 1849 he spent most of his time painting seven Biblical subjects, seventeen by eleven feet in size, to pay for a farm of 520 acres in Adams County, Illinois, near Quincy. The price of the land was $8,000, paid for by $1,000 in cash and seven pictures at 1,000 each. This ended disastrously, as there is evidence that the Mr. Smith with whom he dealt also sold the same farm to someone else. In spite of Quidor’s efforts when he want to Illinois to look into the matter, he never gained title to the property. In the years 1851 to 1868 Quidor was listed in the New York Directories as “artist” and “painter,” as opposed to the designation from 1827 to 1836 of “portrait painter.” In 1863 he was listed as “farmer,” possibly a venture in a more stable activity than his painting. It is believed he stopped painting in 1868, when he moved to the home of his daughter, Mrs. Anna Doyle, at 98 Clinton Avenue on Jersey City Heights. There he spent the last years of his life, and it is evident that he stopped painting because of old age, and not poverty. Mount knew clearly why he painted the way he did, as he himself stated: "Paint pictures that will take with the public, in other words, never paint for the few, but for the many -- Some artists remain in the corner by not observing the above." In the Foreword to the catalogue Mr. Baur says, "Of the many nineteenth century American painters who have suffered neglect in recent years, William Sidney Mount ranks among the most important. First of our artists, in point of time, successfully to exploit local genre, he heads the long line of realist painters in this field, which widened rapidly with the advance of the century. As a Long Island painter, limning almost exclusively the life and landscape of his native Setauket and Stony Brook, it seems particularly fitting that the first comprehensive showing of his work be held in the Museum. But his position as the Island's outstanding painter of this epoch should not obscure the wide signifigance of his art in relation to American painting as a whole. His portraits, his crisp pencil drawings, his remarkably free oil sketches and, above all, his solidly painted genre scenes are the important evidence not only of pioneering efforts but also of the inherent quality of his work." Collectors have preserved Quidor's work for posterity. Probably the first public recognition he received since his death was the hanging of six of his painting in the Brooklyn Museum, which were lent between 1897 and 1912. For a painter who was able to paint for forty-five years, the thirty-five works on record constitute a small production. It is possible there were others, but Mr. Baur believes the indifference shown his formal work would account for their scarcirty. There are no known examples of his banner and fire-engine backs on which he spent a good deal of time in order to earn a living. In discussing “Ichabod Crane Pursued by the Headless Horseman of Sleepy Hollow,” Mr. Baur states that although it is not done as romanticism in the grand manner of the 17th Century, “it is a peculiarly pungent and native brand, imbued with the rough humor of a new country and with an intensely individual feeling for the folklore which inspired it.” In other pictures he displayed his peculiar talents for caricature and baroque design, as shown in the profusion of fanciful grimaces and distortion which he employed. He is also admired as a colorist. 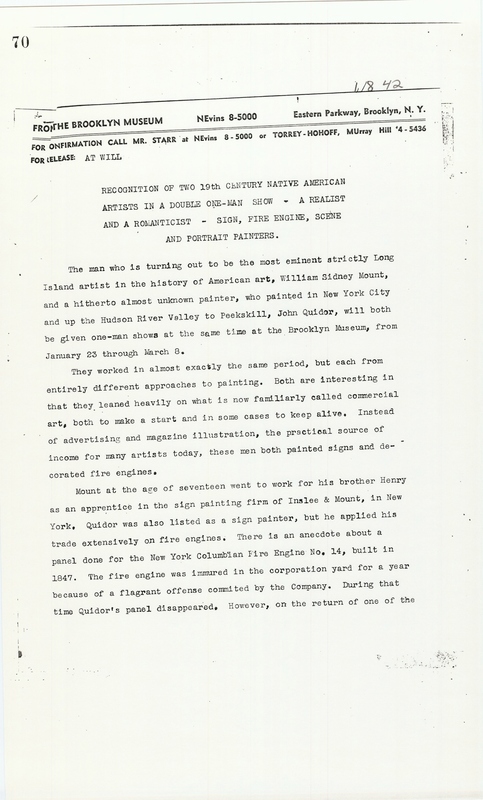 Dunlap’s short mention of Quidor includes this statement: “His principal employment in New York, has been painting devices for fire engines, and work of that description.” There is an anecdote about a panel done of the New York Columbian Fire Engine No. 14, built in 1847. The fire engine was immured in the corporation yard for a year because of a flagrant offense committed by the Company. During that time Quidor’s panel disappeared. However, on the return of one of the members of the Company, who was a mate on board one of the Havre Line packets, he produced it and restored it to the Company. He had taken it to France on his voyages. Thus a Quidor got to France, probably the only one to do so. Both the panel and the engine finally disappeared. In the Jersey City Argus of the 15th of December, 1881, an obituary said that in his early farming life Quidor manifested a talent by drawing large religious figures with chalk on boards, even on barn doors. He is thereby considered to have shown early an interest in a taste for boldness and largeness of design. Brooklyn Museum Archives. Records of the Department of Public Information. Press releases, 1942 - 1946. 01-03/1942, 014-20. January 14, 1942 Two native Americans, William Sidney Mount, who has been called “Long Island’s Artist,” and John Quidor, both of whom painted during almost the same span of years in the 19th Century, in and around Long Island and New York City, and who have not received the recognition they deserve in the opinion of officials of the Brooklyn Museum, are brought forward at the Museum in simultaneous one-man shows beginning Friday, January 23, after an invitation preview on Thursday, January 22. The exhibitions continue through March 8. The exhibitions follow the policy of the Museum of presenting to the public today, American artists of merit who have been neglected. Mount lived on Long Island and Quidor in New York City, and their respective dates are 1807-1868 and 1801-1881. These are the first comprehensive exhibitions of the work of each man to be shown in this century. Research on both men was done by John I. H. Baur, Curator of Painting and Sculpture, at the Brooklyn Museum. The Quidor catalogue is the first complete exposition and discussion of the artist’s life and work. The Mount catalogue is confined to a few remarks, as it consists principally of the long list works shown, with copious notes where possible, and a chronological table of Mount’s life. A discussion of Mount was omitted as a complete life of the artist is about to be published by Hermann W. Williams, Jr., of the Metropolitan Museum, in collaboration with Bartlett Cowdrey, of the Brooklyn Museum. One hundred and eight paintings and drawings by Mount are shown, and sixteen of the eighteen known paintings by Quidor. The Mount subjects are portraits, figures and scenes. Each man’s work is hung in separate galleries. They are shown at the same time because, though they worked in the same period, they had entirely different approaches to painting. Mount had some breadth of reputation in his own day, but Quidor was obscure as far as the public was concerned. Mount is considered the first American genre painter, a painter of familiar and homely subjects. His popularity stemmed somewhat from the manner in which he painted and in his approach, which was the preference of the time; that is, realism and the use of familiar subjects. Quidor, on the other hand, was a romantic who took for his subject-matter imaginative, fanciful ideas from the works of American writers who were his contemporaries, especially Washington Irving and James Fenimore Cooper, which he painted in a lusty humorous, robust manner. An idea can be gained of Mount’s work from the titles of the pictures: “The Truant Gamblers,” “Bargaining for a Horse,” “Farmers Nooning,” “Raffling for a Goose,” “Fortune Telling,” “Children with Bird’s Nest,” “Eel Spearing at Setauket,” “View of Crane Neck, Setauket," Who'll Turn the Grindstone?" "View of the Sound Over Long Island Shore,” “Barn on the Salt Meadows,” and “A Suffolk Scene.” About a dozen works were reproduced by lithography and engraving. Three were engraved in this country and six hand-colored lithographs were produced by Goupil & Vibert in Paris. Many excellent records of Long Island scenes are preserved in several of the paintings. He often used his neighbors as model; the subjects were frequently scenes on his farm and from neighboring localities. The studio on Long Island, where he worked for many years, was the attic of the Mount homestead at Stony Brook, which is still standing. It is owned by Mrs. Edward P. Buffet, whose husband wrote the first extensive life of Mount. The principal lenders of Mount’s works to the exhibition are Mrs. Scott Kidder and the Estate of Edith B. Douglass of Newton Highlands, Massachusetts. Public institutions which have lent pictures are: The Addison Gallery of American Art, Buffalo; The Art Institute of Chicago; The Brooklyn Museum; The Century Association; the City of New York; The Corcoran Gallery of Art, Washington; the Detroit Institute of the Arts; The Metropolitan Museum of Art; The New York Historical Society; the New York Public Library; The New York State Historical Association; The Pennsylvania Academy of the Fine Arts; the Whitney Museum of American Art. Mount was a close friend of Benjamin S. Thompson, Long Island’s well-known historian and public character, whose portrait he did. The painting was used for the frontispiece of the third edition of Thompson’s “History of Long Island.” Mount visited Thompson in Hempstead and painted several other people in the community. Some of his sitters were Reverend Zachariah Greene, the Fighting Parson and Thompson’s father-in-law; Reverend William L. Carmichael, Rector of St. George’s Church, Hempstead; General Satterlee, officer, of militia and postmaster of Setauket; Judge Selah B. Strong of Setauket; Bishop B. T. Onderdonk, Fourth Bishop of the Episcopal Diocese of New York, whose portrait is owned by Columbia University; and several members of the Seabury family, to whom he was related. This is the family of the present eminent Samuel Seabury. The portrait of General Jeremiah Johnson, Mayor of Brooklyn, was lent to the exhibition by the City of New York. It has hung in the Brooklyn City Hall. 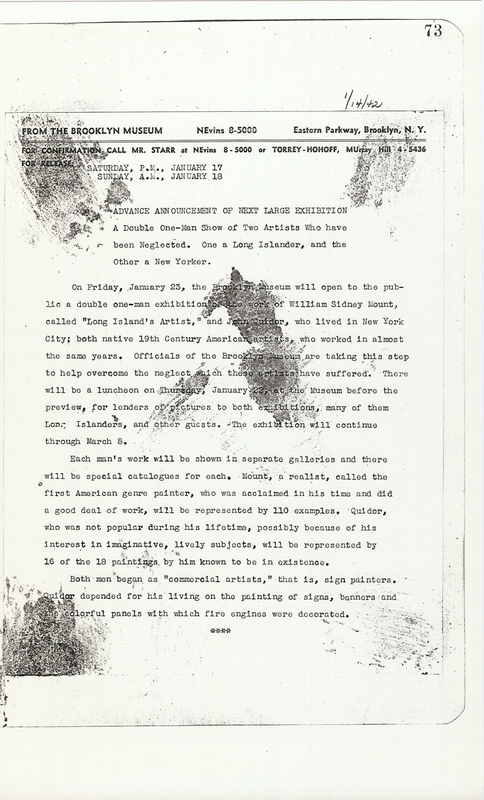 Although Mount was recognized in his own day, his name has been forgotten except by the comparative few, some in the art field and others in Long Island, particularly around Stony Brook, Mount's home neighborhood, and other communities where he is remembered by those who own his works, which they have lent generously to the exhibition. He was eminent enough in 1834, when he was twenty-seven, to have a page and a half devoted to him in William Dunlap’s volume on American Art and design, published in the year, the first American art reference book. There are no indications of economic struggle on Mount’s part. Some of this, at least, was due to his success at obtaining work and selling pictures. He had another interest besides painting, which was music. One result of this was his development of a new type of violin called “The Cradle of Harmony” or “Hollow Back Fiddle.” Another expression of his ingenuity was portable studio which he planned and built. It is now part of a house on Long Island. Mount was put in contact with painting when he served as an apprentice in his brother Henry’s business of sign painting, that operated under the name Inslee & Mount, in New York City. While learning this trade it was discovered he had sufficient talent to justify his striking out on a career as professional painter. Mount was born in Setauket, Long Island. His father was both farmer and inn keeper. When Mount was nine years old, his mother moved the family from the tavern to the farm of her father, Jonas Hawkins, at Stony Brook. At seventeen the young man started his apprenticeship with his brother’s newly founded sign-painting business. But two years later he entered the Art School of the National Academy of Design and exhibited for the first time at the Academy in 1828. In 1829 he decided to become a portrait painter, and took up residence in New York City where he lived until 1836. In 1831 he was elected to full membership in the Academy at the age of twenty-five. From 1836 until his death in 1868 his residence was Stony Brook, but he travelled about considerably, visiting New York and going up the Hudson valley. Mount knew clearly why he painted the way he did, as he himself stated: “Paint pictures that will take with the public, in other words, never paint for the few, but for the many -- Some artists remain in the corner by not observing the above.” In the Foreword to the catalogue, Mr. Baur says, “Of the many nineteenth century American painters who have suffered neglected in recent years, William Sidney Mount ranks among the most important. First of our artists, in point of time, successfully to exploit local genre, he heads the long line of realist painters in this field, which widened rapidly with the advance of the century. As a Long Island painter, limning almost exclusively the life and landscape of his native Setauket and Stony Brook, it seems particularly fitting that the first comprehensive showing of his work be held in this Museum. But his position as the Island’s outstanding painter of this epoch should not obscure the wider significance of his art in relation to American painting as a whole. His portraits, his crisp pencil drawings, his remarkably free oil sketches and, above all, his solidly painted genre scenes are the important evidence not only of pioneering efforts but also of the inherent quality of his work." Brooklyn Museum Archives. Records of the Department of Public Information. Press releases, 1942 - 1946. 01-03/1942, 021-4. Mr. Joseph T. Fraser, Jr.
Mr. and Mrs. Bartlett H. Hayes, Jr.
Dr. Hermann W. Williams, Jr.
Brooklyn Museum Archives. Records of the Department of Public Information. Press releases, 1942 - 1946. 01-03/1942, 025-6.